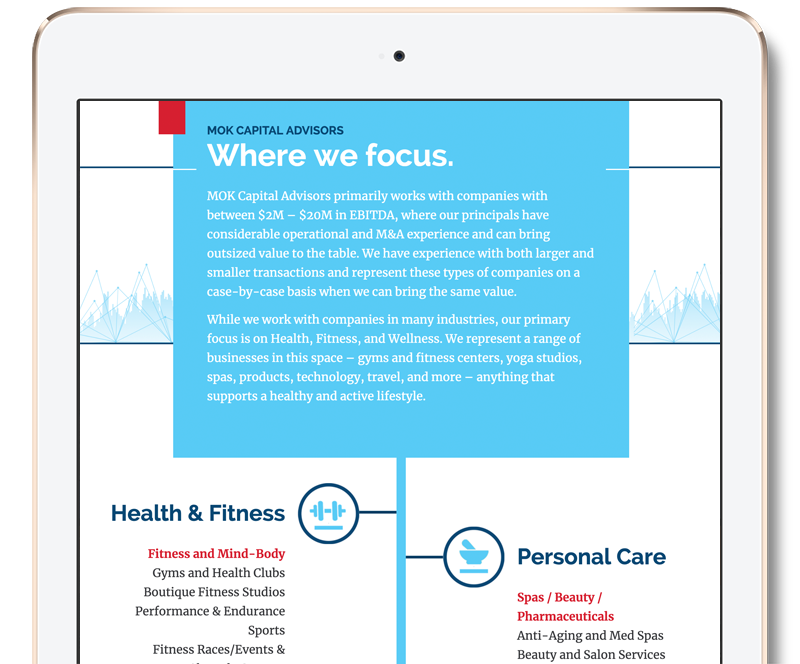 MOK Capital Advisors is a boutique mergers and acquisitions (M&A) advisory firm with a specialty in the Health, Fitness, and Wellness industry. They work with sellers to maximize the value of their assets; and they work with buyers to match them with the right opportunity for their unique situation. MOK analyzes and evaluates businesses, positions and markets them to their network of buyers and sellers, and facilitates the closing of transactions. Our design approach focused on creating a blend of visual aesthetics – combining the look and feel of a "traditional financial advisor's brand" with the energy and styling of the businesses they serve. Stark / Raving partnered MOK Capital Advisors to create a comprehensive brand strategy that touched every visual aspect of their business. The brand is an authentic reflection of the company, their passion and dedication to maximizing value for each of their clients. Utilizing a flexible layout and modular grid system, the website automatically adjusts to provide an optimized experience across desktop, mobile and tablets.